Innovations, investments, strategies and opportunities introduced at the speed of business. On a typical day, how excited are you to go to work? Do you love your job enough to recommend the company to a friend? If you answered, "Yes," to both of those questions, chances are you're confident about the future of the company you work for, and you're in good company. 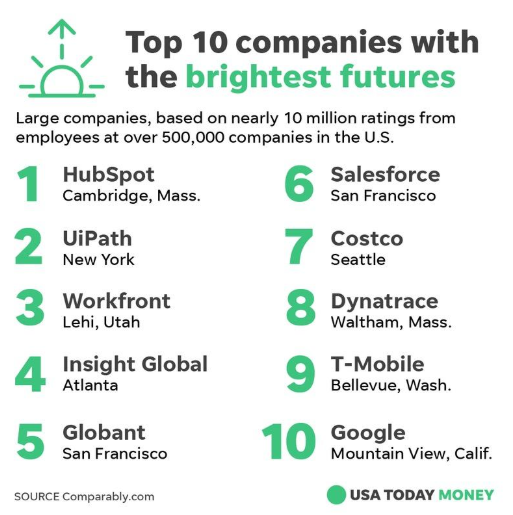 After looking at nearly 10 million ratings from employees at over 50,000 companies, compensation, culture and career monitoring website Comparably.com identified the top 50 large and small companies that have the brightest futures, according to workers. Comparably found workers at the following companies were the most optimistic about the year ahead: software development firm HubSpot, automation vendor UiPath and the software firm Workfront. "If you look at the large companies list, you see that they are driving toward using AI, automation and machine learning," said Jason Nazar, CEO and Founder of Comparably. "Their core business is at the forefront of a massively changing tech industry." Cutting-edge technology makes "employees and team members more excited about the future," Nazar said. Other large companies that made Comparably's list include Salesforce (ranked 6th), Costco (7th), T-Mobile (9th) and Google (10th). Of course, not everyone works for megacompanies like Microsoft (ranked 12th) and The Walt Disney Company (13th). For people employed by small or mid-size companies with fewer than 500 employees, jobs with the best outlook are Highspot, a cloud-based sales platform; SendGrid, a customer communication platform; and Drift, a marketing company. "On the smaller list, you'll find companies that are pushing the boundaries of what you’re able to do," Nazar said. "For example, SendGrid is at the forefront of AI and machine learning and email communication for their customers." Comparably Awards are derived from ratings provided by employees who anonymously rated their employers on Comparably.com between March 8, 2018 and March 8, 2019. There were no fees or costs associated with participating, nor was nomination required. The final data set was compiled from nearly 10 million ratings across 50,000 U.S. companies. To qualify, Large companies (more than 500 employees) must have a minimum of 50 employee participants and Small/Mid-Size companies (fewer than 500 employees) must have a minimum of 15 employee participants. Additional weight was given to companies with more participation from their employee base. To read the article on USA Today, visit here.